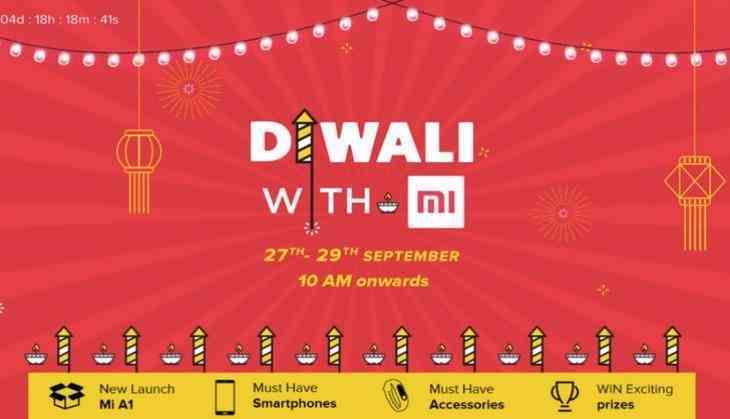 As the festival season begins with various online deals, Chinese electronics and software company Xiaomi is back with exciting Diwali sale offering Mi smartphones, accessories, and Air purifiers at discounted prices. Recently the online e-commerce giants Amazon and Flipkart offered heavy discounts during the recently concluded round one of Diwali sale. The online sale started on 27th September and will last till September 29. There is an online contest 'The Diya Hun' run by Xiaomi in which users can play to win discounts. The offers of Chinese brand range from smartphones to smart home products like Air Purifiers and bluetooth speakers. Last year, the MI sale was conducted in October and was fairly popular. Similarly to last year, the company has launched the bid to win and Re 1 flash sales. Interestingly, he customers who holds Mi Account have chance to win coupons daily at 10 AM during the sale period whereas the Re 1 flash sale will be conducted at 11am and 5pm daily. The customers who wants to make payments using Indian electronic payment and e-commerce Paytm will be eligible to get an additional Rs 400 cashback on every Redmi Note 4 purchased via Paytm. The Redmi Note 4 (3GB RA,32GB ROM variation) will be offered at a markdown of Rs 1,000 at Rs 9,999. The higher variation (4GB RAM,64GB ROM variation) is valued at Rs 10,999 with a flat discount of Rs 2,000 off and will be up for gets at Rs 10,999. The company will offer an extraordinary lake blue version of the gadget at Rs 12,999 for 4GB/64GB variation. Redmi 4A (2GB RAM,16GB ROM variation) will continue to be accessible at Rs 5,999. The 3GB RAM, 32GB ROM variation will be offer at Rs 6,999. Smartphone was found to be the preferred mode for shopping thanks to the improved mobile internet penetration led by 4G revolution. About 65 percent of the users shopped via their smartphone as against only 55 percent last year. This was also driven by the additional discounts offered by e-commerce players for in-App purchases. The maximum participation was seen from metros such as Bangalore, Delhi, Mumbai, Hyderabad, Chennai, Kolkata and Gurgaon. However, tier-2 cities Lucknow, Guwahati, Pune, Ahmedabad, Jaipur, Salem, and Patna also participated enthusiastically.